There is no better place to bring romance into your home decorating than in the bedroom. This is the room where we relax, recharge, and have private time away from the bustle of everyday life. Here are some great ways to punch up the sizzle in your bedroom (ok, I am just talking decorating here, folks…) without leaving your bank account fried! Try these romantic bedroom ideas! Use color to soften the room, and spice up the mood. 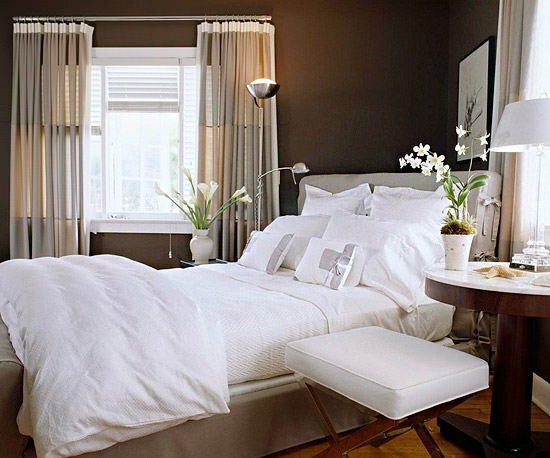 The bedroom is a great place to use those warm, sensual colors usually not used in more public spaces. Add drama with rich reds, elegance with regal purples, or a little fantasy with a deep blue ceiling covered with painted stars. All it takes is a can of paint and a little nerve to create an intimate space you’ll dream of all day long! We couldn’t find the true source for the photo below. If anyone knows, please let us know in comments. Add four poster feeling with a four dollar budget. Layer the bed with romance. Most of us have a bedspread or comforter on the bed, but consider adding layers to your bedding to create a bed and breakfast feel right in your own bedroom. Add extra pillows with shams, throw pillows and even a soft blanket throw to cuddle up with on a cool afternoon. A quilt folded up at the foot of the bed promises a cozy night, and a soft rug laid on the floor keeps toes happy come morning. Photo courtesy of BHG. 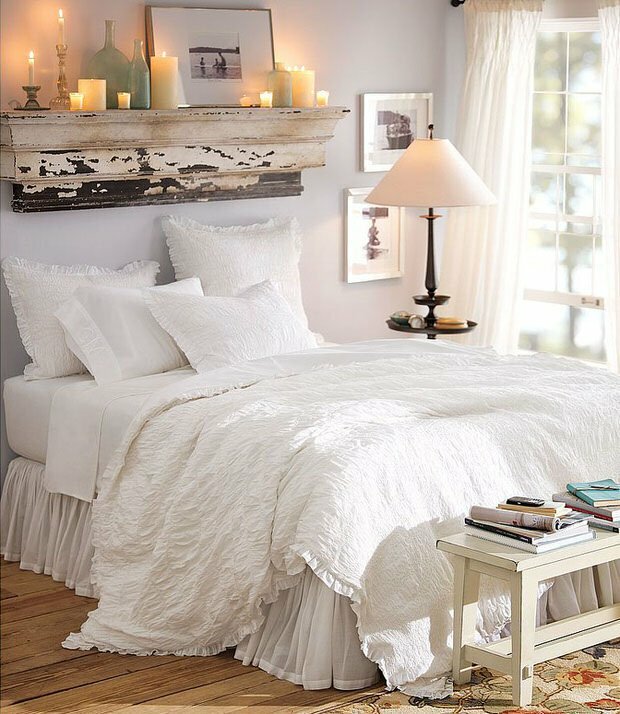 This is another example of layering on the pillows and quilts to give a “cozy up tonight” look to your bedroom! Also loving the flowers on each nightstand! Very romantic bedroom idea! Photo courtesy of Pottery Barn. Lighting for mood is greatly overlooked in the bedroom, but since we use this room mostly at night, it shouldn’t be! Add inexpensive can lights from the home improvement store to each corner of the room to add drama and flair. Make sure there are reading lights available if you read in bed, and install a dimmer switch on any overhead lighting. Also don’t overlook the value of candlelight in the bedroom! Candle sconces can be mounted on the walls, or groupings of candles can be set on night tables. Remember to never leave candles unattended. Photo courtesy of Pottery Barn. Use scent to create a romantic atmosphere. Set out potpourri or scented oils, or try spritzing your linens with your favorite scent before you make the bed. Consider using subtle scents such as patchouli, sandalwood, or lavender. Scented sachets can be tucked into pillow cases, and some scents are even said to help with restful sleep! 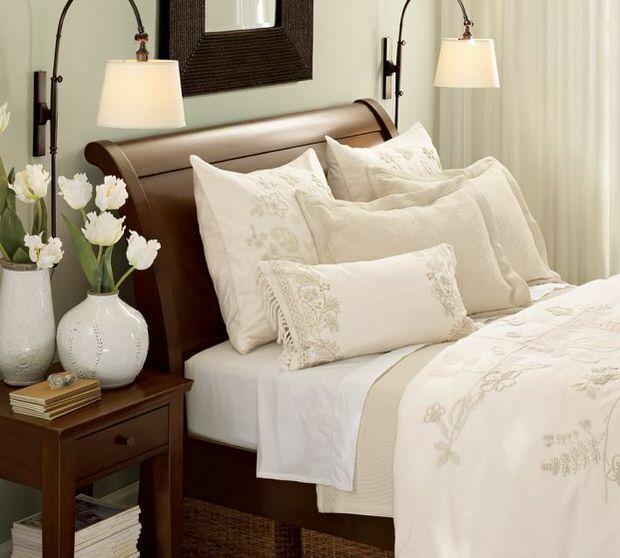 Obviously you can’t go wrong with fresh cut flowers as in this lovely bedroom from ‘Pottery Barn’. Finally, try rearranging the room’s furniture and accessories for a new “view”. Little changes like a new coat of paint and some dramatic lighting is all it takes to transport you to an exotic resort feel away from it all. Easy ways to use these romantic bedroom ideas to create a haven for you and the one you love! 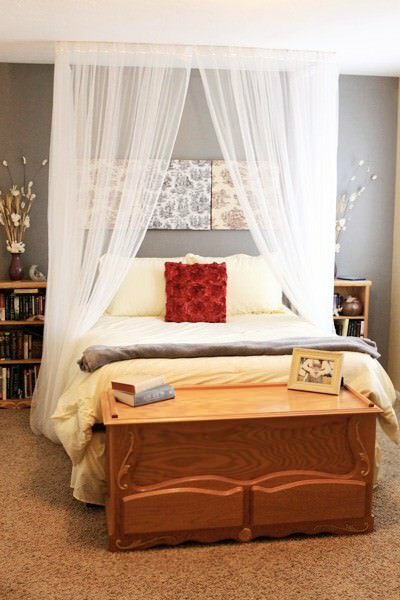 Now jump right on over to our posts on DIY Canopy Beds and Starry Starry String Light Decor! Previous Post How to Reupholster Almost Anything! Does anyone know what color that pottery barn duvet is? Looks like they offer that one in a blue and a grey, but I can’t quite tell what one it is. The blue one on the pottery barn website looks more like a denim blue…. Color is great, everything looks great but bed, looks hard not warm & inviting. maybe fuzzy rug by bed. You can buy it at pottery barn! Where can I buy the white duvet from the “Light up the night” photo? I’m sorry Deborah, it’s not our project so I have no idea! Readers, anyone seen one like this? Have seen similar bedding on Anthropologie web site.